Margaret Hughes Vath, instructor of law, was elected president of the Atlanta Bar Association. Members of the Atlanta Bar Association elected Margaret Vath, instructor of law, as president, Nicole G. Iannarone, assistant clinical professor, as vice president/president-elect, and A. Craig Cleland (J.D. ’92) as treasurer for the 2017-18 term. Both Vath and Iannarone served on the board last year, with Vath as president elect and Iannarone as secretary. At the end of the term, Vath will turn over her duties as president to Iannarone. 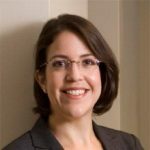 Nicole G. Iannarone, assistant clinical professor, was elected vice president and president-elect of the Atlanta Bar Association. “Maggie is a talented leader and I look forward to working with her. When she passes the torch, there is no question that meeting the high bar she establishes will be a challenge; but I know her hard work will most certainly create the best possible infrastructure from which to do so,” Iannarone said. A. Craig Cleland (J.D. ’92) was elected treasurer. Cleland, represents employers in employment-related litigation, including class actions and complex litigation, at Ogeltree Deakins Nash Smoak & Steward PC. He’s also an adjunct faculty member at Georgia State Law, teaching courses in complex litigation and employment discrimination law.